We try to keep a logical order in the blogposts. Continuing from the previous post where we ended in Kalgoorlie, we now continue our journey back towards the coast. From Kalgoorlie, it is about 400 km south to Esperance. Along the road there are some sightings, such as a pink lake and Dundas Nature Reserve (and the remains of a town within that reserve). Only one town to stop: Norseman. Since the weather wasn’t cooperative, we didn’t stop very much, except for the Dundas Rocks and Norseman. We found it very exciting to sea the water again, after about a week in the outback (we weren’t trained at the time 😉 ). Especially because it seems the road drops in the ocean. This part of Australia boosts nature. 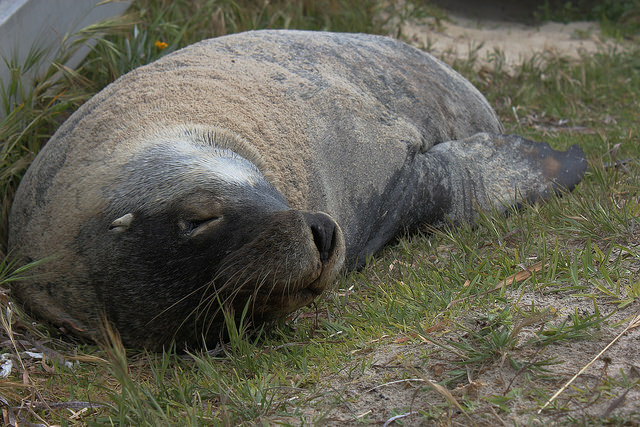 We loved our date with the sea lion, but if you drive about 50 km to the east, you’ll find a beautiful national park: Cape Le Grand. We lacked time, otherwise we would have visited Cape Arid NP as well (so that is still on our to do- list). 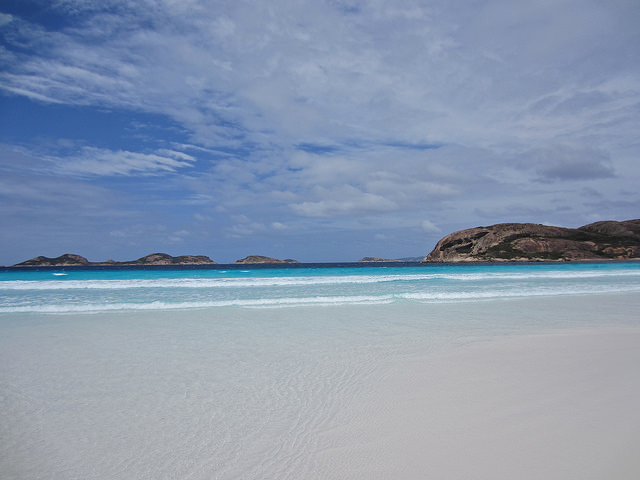 Cape Le Grand is best known for the whitest beach of Australia: Lucky Bay. And yes, even on a cloudy day, it is dazzling white! We didn’t see any kangaroos on the beach, although they visit this bay often. Other spots to visit are Hellfire Bay, Thistle Cove (if you don’t mind a zillion flies) and Frenchman Peak. If you are lucky, you’ll spot a bunch of western grey kangaroos on your way back, like we did.